Ender's Game Fansite: A news resource for the Ender's Game movie and book series. 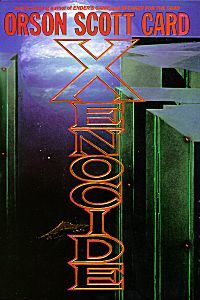 Description: Xenocide is the direct sequel to Ender in Exile, although it was originally published as a sequel to Speaker for the Dead. It is proceeded by Children of the Mind. “On the world Lusitania there are now three sapient races-the Pequeninos, who evolved there; Humans, who came to colonize; and a Hive Queen and her children brought by Ender long years ago. But on Lusitania there is also the descolada, a virus deadly to human beings which would spread like wildfire throughout the Stairways Congress should it ever escape the planet. The Starways Congress decided that The descolada should be wiped out once and for all, and sent a fleet, armed with a planet-destroying weapon, to do it. A fourth intelligence, loyal to Ender and Lusitania caused that fleet to disappear.